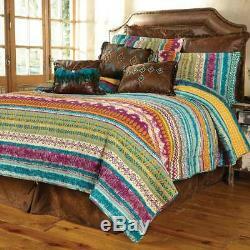 Bring the spirit and style of the Great Southwest to your home with this colorful quilt set. Features gem colors of fuchsia, gold and spruce in contrast with vivid pink and robins egg blue in native American motifs. Reverses to a coordinating primitive diamond print for two looks in one. 100% Cotton, and prewashed for added comfort. Machine quilted with fabric bound edges for durability and added texture. ACCENT PILLOWS ON BED NOT INCLUDED. 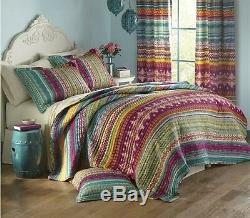 3pc Set Includes: Full/Queen Quilt + 2 Shams (see below for sizing). Color: Fuchsia, Gold, Spruce, Pink, Robins Egg Blue. Quilt: Full/Queen - 90 x 90 inches. 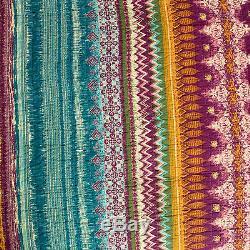 Standard Shams (two): 20 x 26 inches. FAUX BROWN LEATHER ACCENT PILLOWS. The item "SOUTHWEST LODGE Full / Queen QUILT SET RED GREEN SOUTHWESTERN NATIVE TRIBAL" is in sale since Tuesday, May 12, 2015. 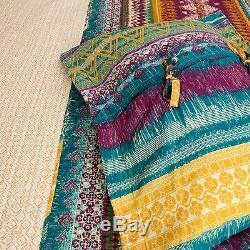 This item is in the category "Home & Garden\Bedding\Quilts, Bedspreads & Coverlets". The seller is "house-to-home-designs" and is located in Forest Hill, Maryland. This item can be shipped to United States, Canada, United Kingdom, Denmark, Romania, Slovakia, Bulgaria, Czech republic, Finland, Hungary, Latvia, Lithuania, Malta, Estonia, Australia, Greece, Portugal, Cyprus, Slovenia, Japan, China, Sweden, South Korea, Indonesia, Taiwan, South africa, Thailand, Belgium, France, Hong Kong, Ireland, Netherlands, Poland, Spain, Italy, Germany, Austria, Israel, Mexico, New Zealand, Philippines, Singapore, Switzerland, Norway, Saudi arabia, Ukraine, United arab emirates, Qatar, Kuwait, Bahrain, Croatia, Malaysia, Brazil, Chile, Colombia, Costa rica, Dominican republic, Panama, Trinidad and tobago, Guatemala, El salvador, Honduras, Jamaica, Bahamas, Viet nam, Uruguay.